Liverpool had to come from behind and hold their nerve with 10 men as they beat Crystal Palace to go seven points clear at the top again. Not many sides manage to breach the back line of Liverpool, these days. It’s absolutely right that the Reds make opponents work hard for any big chances—but it has to also be acknowledged that, sometimes, goals are simply very well constructed. The Reds’ press from the front is one of the most talked-about tactical aspects of the league, never mind just of Jurgen Klopp‘s team. But on this occasion, against Palace, an extra-aggressive version of it didn’t work—and left the Reds wide open. Five or six attackers attempted to win the ball back outside the Palace box, but the control and angles they found on their passes should be applauded. One further pass meant Liverpool’s entire midfield was bypassed, and only a few touches later it was 1-0 to Palace. Minor points can be noted—Joel Matip a little deeper than the rest, Fabinho a little deep before closing the space, Alisson‘s side-step—which might have prevented the goal in the end, but sometimes it’s just a very good goal. …And the response, when it came, was emphatic. Keep the faith, follow the pattern, remain patient… up the tempo. That would likely have been the thought process of most Liverpool fans and the message of Klopp in the dressing room at half time, and the Reds certainly came out all guns blazing after the restart. 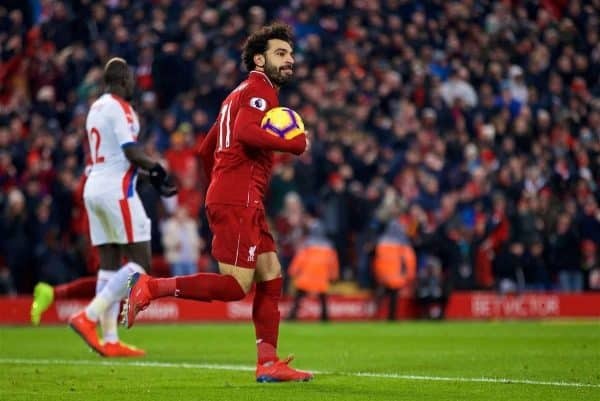 Mo Salah‘s inventive, and frankly ridiculous, finish just a few seconds into the second half not only levelled the scoreline, it also served to fire up the crowd and perhaps remind the Reds themselves of how quickly they can play, how good they can be. Palace, like most teams, couldn’t live with Liverpool once they resumed the quick passing, the one-twos, the intricate angles of their own to dominate possession and shift around the defence. Roberto Firmino scored seven minutes later to complete a quickfire turnaround and put all the pressure back on Palace’s side, forcing them to abandon the 10-man defensive line if they wanted anything out of the game. 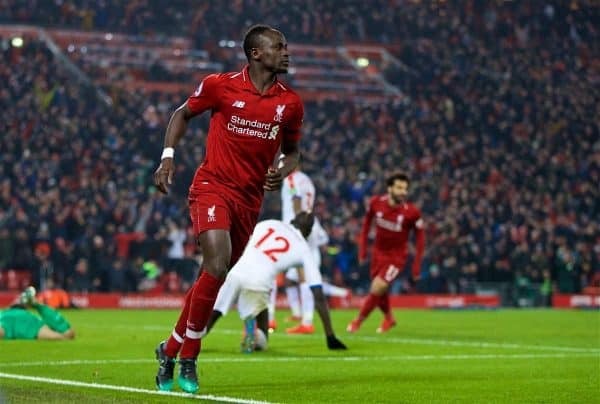 Later, that same incredible mentality and capacity to rebound from setbacks was on show twice more, as the Reds scored a go-ahead third and then a fourth after going down to 10 men. Trent Alexander-Arnold might have a new deal to his name, but he remains sidelined through injury. Despite Klopp suggesting he was close to returning, he’s not there yet. James Milner filled the void, with Joe Gomez also still out, but he had an extremely tough afternoon against Wilf Zaha, Palace’s key man. The opening goal came from that side, with Zaha stripping the veteran midfielder for pace, but for much of the first half and certainly in the second after the Reds went ahead, Zaha targeted Milner at every opportunity. It didn’t take much for the Palace winger to get free, given the disparity in acceleration and the vast space he had to operate in, but Klopp did have options to change the one-vs.-one approach. Rafa Camacho could have been a direct, pacy opponent to match Zaha, albeit an extremely raw one, while Fabinho has greater strength and pace in one-on-one situations. 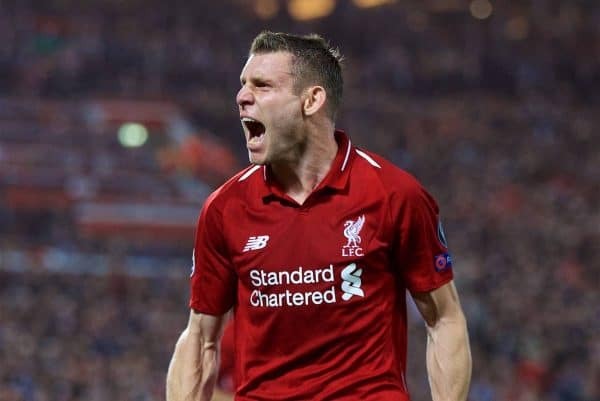 Klopp stuck with Milner though—and massive credit goes to the versatile No. 7 for his part in the Reds’ resurgence. More than once he kept moves going when it would be easy to give up on an overhit pass, a seeming dead-end when surrounded by defenders or when few options were available to pass to. Key among that effort was his reaching a diagonal ball and putting over any kind of cross at all—spilled by ‘keeper Julian Speroni and touched in by Salah for 3-2. But that’s not all: Milner’s up-and-down game was compounded by two yellow cards, for two fouls on Zaha. 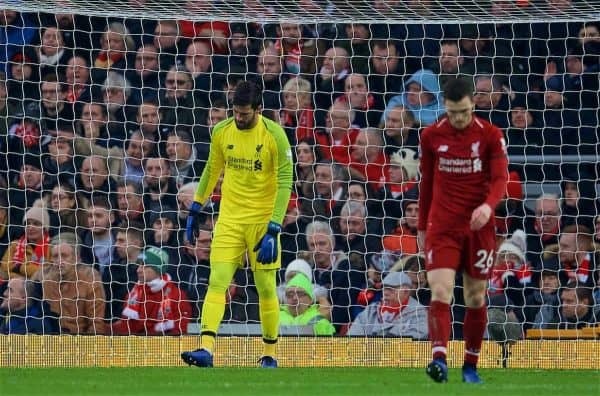 The Reds had to thus see out the final minutes with 10 men and, if Trent doesn’t recover in the next 11 days, Klopp will have to decide on a new option for right-back against Leicester at the end of the month. What more can we say about the Egyptian king? A great team’s top goalscorer must not just continuously find the net, but do so when the need is most dire. A goal down and then hauled back level, with less than 20 minutes to play, means both his goals against Palace check that particular box. An instinctive finish to level and then the determination to reach the ball first to put the Reds back in front highlight not just his confidence, but his single-mindedness and now natural inclination to do whatever is necessary to score. It’s 50 goals for the Reds already, in just 72 games—the same numbers as Fernando Torres posted, despite not being a true No. 9 for anywhere near all of those appearances. A superb strike rate for a superb player. It was, for a good few minutes between 3-2 and Milner’s red card, extremely nerve-wracking. Sadio Mane‘s late fourth was met by wild relief and jubilation—and just as quickly by conceding another unhelpful goal to Max Meyer. 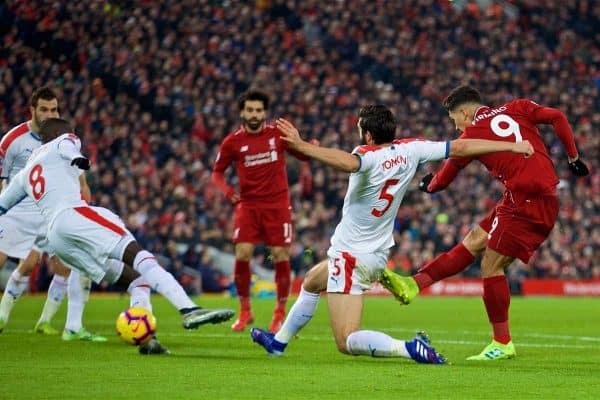 Sometimes, though, games simply have to be won by whatever means necessary, and that was the case here as the Reds got over the line by sheer willforce, it seemed. Heading to Dubai now for a well-earned break means, hopefully, some players should recover from injuries and knocks—Fabinho‘s late exit is another worry to contend with—and some tactical work can be done too, as well as fitness. 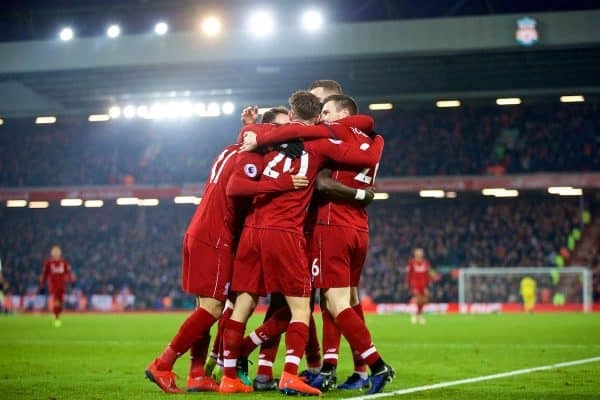 The players will reconvene at Anfield at the end of the month to face Leicester City, where the aim will be to record a quite incredible 20th league win from 24 matches. Top of the table, seven clear again and the pressure, for now, is back on Man City.